HarperCollins, 2010. Format: Kindle edition. File size: 892 KB. Print length: 244 pages. eISBN: 9780007422258. ASIN: B0046RE5FO. First published in the US by Dodd, Mead and Company in October 1956 and in the UK by the Collins Crime Club on 5 November of the same year. First paragraph: It was Miss Lemon, Poirot’s efficient secretary, who took the telephone call. Synopsis: A charity murder game at a Devon house turns into the real thing. Sir George and Lady Stubbs, the hosts of a village fête, hit upon the novel idea of staging a mock murder mystery. In good faith, Ariadne Oliver, the well known crime writer, agrees to organise their murder hunt. Despite weeks of meticulous planning, at the last minute Ariadne calls her friend Hercule Poirot for his expert assistance. Instinctively, she senses that something sinister is about to happen… Beware – nobody is quite what they seem! 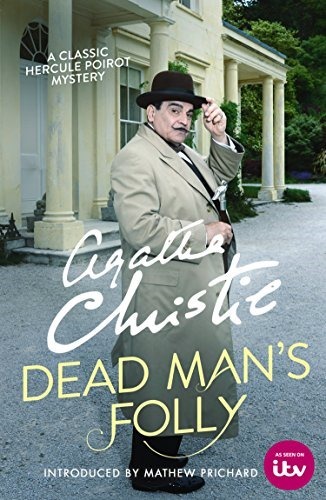 More about this story: Dead Man’s Folly sees the return of Ariadne Oliver, who summons Poirot to a country house to investigate a lingering suspicion, which she fears might lead to something serious. The country house in question was inspired by Agatha Christie’s own holiday home, Greenway House in Devon, which looks over the River Dart and contains many of the features mentioned in the novel. Now owned and managed by the National Trust, it was also used in the filming of the TV adaptation in 2013, starring David Suchet and Zoë Wanamaker, one of the final episodes in series 13 of Agatha Christie’s Poirot. The main plot first saw the light of day in the form of a novella only recently published as Hercule Poirot and the Greenshore Folly. In 1954, Agatha Christie wrote the story with the intention of donating the proceeds to a fund set up to buy stained glass windows for her local church at Churston Ferrers, and she filled the story with references to local places, including her own home of Greenway. But having completed it, she decided instead to expand the story into a full-length novel, Dead Man’s Folly, which was published two years later, and donated a Miss Marple story (Greenshaw’s Folly) to the church fund instead. Dead Man’s Folly was dramatised for BBC Radio 4 in 2007, starring John Moffatt as Poirot and Julie McKenzie (better known for her role as Miss Marple) as Ariadne Oliver. I-play released a downloadable hidden objects game in 2009 based on the story and a graphic novel adaptation was published in late 2012. My take: At the request of the much-renowned mystery novelist Mrs. Ariadne Oliver –whom Poirot had known before at Cards on the Table and Mrs McGinty’s Dead– Poirot travels to Nasse House, in Devon. Afraid of being overheard, she hasn’t provide him further details over the phone. Once there, Mrs Oliver tells him that there’s a big garden fête tomorrow at Nasse House, the estate of Sir George and Lady Stubbs, and there’s going to be a Murder Hunt arranged by Mrs. Oliver herself. The Stubbs have had so often a Treasure Hunt that they believe this will be a novelty, and they offered Mrs Oliver a substantial fee to organise this event. There’ll be a victim, clues and suspects, everything utterly conventional. Half a crown to enter and you get the first clue and you’ve got to find the victim, the weapon, the culprit and the motive. And there will be prizes. Mrs Oliver has devised everything herself, but she senses that something terribly will happen. For this reason she has made him come with the excuse that Poirot himself will provide the prize to the winners, and asks him to keep a close surveillance upon everyone present. After all, it is Mrs. Oliver murder, so to speak, but she has been getting numerous silly suggestions from different people that seem to be acting through a third party, eager to keep its identity hidden, with the clear intention to alter all her plans. At the day of the fête, Mrs. Olivier worst fears will be confirmed. The young woman playing the role of victim is found dead, strangled. But who has been willing to kill a young innocent woman of barely fourteen years of age? The obvious answer is that she could have seen something she should have not seen. Maybe she just happened to be in the wrong place at the wrong time. Next, something unforeseen happens. Lady Stubbs disappears, and nobody can render account of her whereabouts. And Poirot for the first time in his career seems to give up. For what is known upon the genesis of this novel, it seems clear that Dead Man’s Folly was one of Christie’s favourite novels. Moreover Nasse House is described as Christie’s own home of Greenway. The novel counts with the presence of Mrs. Ariadne Oliver, Christie’s alter ego, and Poirot finds himself on the brink of being defeated. I can’t think of nothing that could made her happier. Besides, Mrs. Ariadne Oliver presence guarantees the story will count with strokes of humour. It is also an excellent example of Christie’s skill in concealing masterfully the clues placed before our own eyes. I must admit I have enjoyed its reading, and, even though, the plot moves on slowly at first, it finally ends up gaining pace as the story begins to progress. My only quibble is that, in my view, Christie has started to repeat herself, perhaps excessively, using and abusing of elements we have already seen on some of her previous novels, particularly in those written immediately before this one. In order not to spoil the story prematurely, please allow me not to give away any further details. Maybe not Christie’s best, but it’s worth reading. Dead Man’s Folly has been reviewed at BooksPlease, Reactions to Reading, Mystery File, Confessions of a Mystery Novelist, Mysteries in Paradise, In Search of the Classic Mystery Novel, and Clothes in Books, among others. Primer párrafo: Fue la señorita Lemon, la eficiente secretaria de Poirot, quien atendió la llamada telefónica. Sinopsis: Un juego benéfico, la búsqueda del asesino, en una casa de Devon se convierte en algo real. Sir George y Lady Stubbs, los anfitriones de la fiesta del pueblo, conciben la original idea de organizar un falso asesinato. De buena fe, Ariadne Oliver, la reconocida escritora de libros de misterio, acepta organizar el falso asesinato. Tras varias semanas de meticulosa planificación, Ariadne acude en el último momento a su amigo Hercule Poirot para obtener su valiosa ayuda. Instintivamente, siente que algo siniestro está a punto de suceder … ¡Cuidado, nadie es lo que parece! Más sobre esta historia: El templete de Nasse-House (el doble sentido del título ingés es intraducible) contempla el regreso de Ariadne Oliver, quien convoca a Poirot a una casa de campo para investigar su persistente sospecha de que pueda ocurrir algo serio. La casa de campo en cuestión se inspira en la propia casa de vacaciones de Agatha Christie, Greenway House en Devon, que se asoma al río Dart y contiene muchos de lod elementos mencionados en la novela. Ahora propiedad y administrado por el National Trust, fue utilizado en el rodaje de la adaptación televisiva del 2013, protagonizada por David Suchet y Zoë Wanamaker, uno de los últimos episodios de la serie 13 de Agatha Christie: Poirot. La trama principal fue publicada por primera vez en forma de libro recientemente con el título de Hercule Poirot and the Greenshore Folly. En 1954, Agatha Christie escribió la historia con la intención de donar los ingresos a un fondo establecido para comprar vidrieras de colores para su iglesia local en Churston Ferrers, y la completó la historia con alusiones a sitios de la localidad, incluida su propia casa de Greenway. Pero una vez que la completó, decidió ampliar la historia a una novela mas extensa, El templete de Nasse-House, que se publicó dos años más tarde, y en cambio donó una historia de Miss Marple (La locura de Greenshaw) al fondo de la iglesia. El templete de Nasse-House fue dramatizada para la BBC Radio 4 en 2007, protagonizada por John Moffatt como Poirot y Julie McKenzie (mas conocida por su papel de Miss Marple) como Ariadne Oliver. I-play lanzó un juego en el 2009 basado en la historia y una adaptación como novela gráfica de la historia apareció a finales del 2012. Mi opinión: A petición de la muy afamada novelista de misterios, la Sra. Ariadne Oliver, a quien Poirot había conocido antes en Cards on the Table y Mrs McGinty’s Dead, Poirot viaja a Nasse House, en Devon. Temerosa de ser escuchada, no le ha proporcionado más detalles por teléfono. Una vez allí, la Sra. Oliver le dice que hay una gran fiesta en el jardín mañana en Nasse House, la propiedad de Sir George y Lady Stubbs, y que habrá una“búsqueda del asesino” organizada por la propia Sra. Oliver. Los Stubbs han organizado tan a menudo una “búsqueda del tesoro”, que creen que esto será una novedad, y le ofrecieron a la Sra. Oliver una elevada compensación económica para organizar este evento. Habrá una víctima, pistas y sospechosos, todo absolutamente convencional. Con media corona la entrada se obtiene la primera pista y se debe encontrar la víctima, el arma, el culpable y el motivo. Y habrá premios. La señora Oliver lo ha ideado todo, pero siente que algo terrible sucederá. Por esta razón, ella lo hizo venir con la excusa de que el mismo Poirot entregará el premio a los ganadores, y le pide que mantenga una estrecha vigilancia sobre todos los presentes. Después de todo es el asesinato de la señora Oliver, por así decirlo, pero ha recibido numerosas sugerencias tontas de diferentes personas que parecen estar actuando a través de un tercero, ansioso por mantener su identidad oculta, con la clara intención de alterar todos su planes. En el día de la fiesta, se confirmarán los peores temores de la señora Olivier. La joven que desempeña el papel de la víctima aparece muerta, estrangulada. Pero, ¿quién ha estado dispuesto a matar a una joven inocente de apenas catorce años? La respuesta obvia es que ella pudo haber visto algo que no debería haber visto. Tal vez solo estaba en el lugar equivocado en el momento equivocado. A continuación, sucede algo imprevisto. Lady Stubbs desaparece y nadie puede dar cuenta de su paradero. Y Poirot por primera vez en su carrera parece darse por vencido. Por lo que se sabe sobre la génesis de esta novela, parece claro que El templete de Nasse-House era una de las novelas favoritas de Christie. Además, Nasse House se describe como la propia casa de Christie en Greenway. La novela cuenta con la presencia de la señora Ariadne Oliver, el alter ego de Christie, y Poirot se encuentra a punto de ser derrotado. No puedo pensar en nada que pudiera hacerla más feliz. Además, la presencia de la señora Ariadne Oliver garantiza que la historia contará con toques de humor. También es un excelente ejemplo de la habilidad de Christie para ocultar de manera magistral las pistas colocadas ante nuestros propios ojos. Debo admitir que he disfrutado su lectura y, aunque la trama avanza lentamente al principio, finalmente termina ganando ritmo a medida que la historia comienza a progresar. Mi única objeción es que, en mi opinión, Christie ha comenzado a repetirse, quizás en exceso, usando y abusando de elementos que ya hemos visto en algunas de sus novelas anteriores, particularmente en las escritas inmediatamente antes de esta. Para no estropear la historia prematuramente, permítame no revelar más detalles. Tal vez no sea la mejor de Christie, pero vale la pena leerla. Thank you, José Ignacio, for the kind link and mention. I agree with you that perhaps this is not Christie’s best or most innovative. I do like it, though. And I particularly like the strong character of Amy Folliat. She made an impression on me. That’s right, Margot, Amy Folliat character is quite impressive.